This website and the supplements are not intended for the purpose of self-diagnosis or self-treatment. In fact, if you have not been evaluated by a doctor, it is very important that you contact us via a message or schedule 15 min. Free Phone consultation before ordering, so that you can be advised on the appropriate products for your particular health objectives. You will be provided with a new patient questionnaire to complete and then we will consult with you to establish whether you might benefit from the use of Wei Labs herbal protocols. 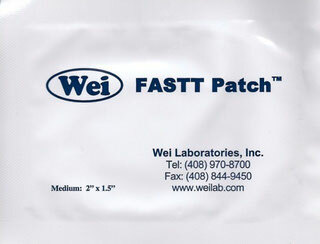 The Wei FASTT patch and WHITEE patch are topically applied Chinese herbal mixture attached to waterproof surgical tape. (It looks like a band-aid). When placed on the injured area, the herbal ingredients migrate slowly through the skin and accelerate the healing of acute or chronic joint, bone or cartilage injuries, as well as injuries caused by overuse. FASTT patches speed up recovery by increasing blood flow and lymphatic circulation. They also increase the necrotic tissue break down and other biological activities necessary for damage repair. FASTT patches also noticeably reduce pain within a few hours on acute conditions. In layman's terms, FASTT patches dramatically reduce inflammation and promote cellular rejuvenation, helping your body heal itself naturally and quickly, so that users don't lose strength due to the injury. They work efficiently and quickly on an acute injury. FASTT patch is recommended for bone, tendon, ligament, muscle, bursitis, TMJ and post-surgical wound in acute condition. This includes acute injuries such as sprains, strains, fractures and all stages of tendonitis. LC Balancer nurtures the kidney and improves microcirculation. Wei Lab recommends that patients over the age of 50 utlilize LC Balancer while using WHITEE patches for more better results. An additional benefit of taking LC Balancer is an increase in energy. WHITEE patches reduce pain, break-up scar tissue and help to restore disc and joint structure and joint, back, and sciatic pain for people with disc injuries and osteoarthritis by increasing blood flow and lymphatic circulation, and by accelerating the biological activities necessary for damage repair. Note: if your injury is chronic (over 6 months), then the WHITEE patch will bring your injury back into it's acute state, causing increased pain at first, and then continuing the healing process as though it was an acute injury. For posture/activity related pain, please resume the posture/activity to help trigger the healing mechanism. WHITEE patch is recommended for disc, joint and cartilage injuries including: bone spurs, bulging discs, disc herniation, osteoarthritis, stenosis, bunions, cysts, gout and chronic injuries that have developed scar tissue. 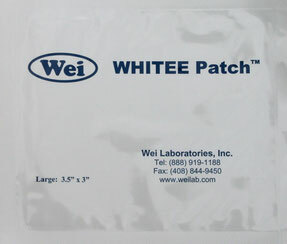 The Wei patches, both FASTT and WHITEE, are very comfortable to wear. The tape is water proof so patients can shower or swim while wearing the patch. Schedule a free call, if you need to be advised on the best protocol for your condition.